Raw materials are sourced from a number of South African and international suppliers. In 2015, Mpact’s Plastics business accounted for 26.5% of Mpact’s group-wide revenue, and 21.8% of overall profit. This division of the JSE-listed Mpact group consists of eight manufacturing sites, divided into five distinct business clusters – PET preforms, bottles, jars and closures in Wadeville (Gauteng); FMCG in Pinetown (KwaZulu-Natal) and Atlantis (Western Cape); Mpact Versapak in Paarl (Western Cape) and Alrode (Gauteng), Mpact Plastic Containers in Atlantis (Western Cape) and Brits (North West) as well as the newly established R350-million-rand PET recycling plant in Wadeville (Gauteng) which opened its doors in the latter part of 2015. With its rPET production, Mpact Polymers provides the Mpact FMCG group with enough recycled PET to service current and future production requirements. This is one example of the way Mpact is maximising resources to ensure we are meeting and exceeding customers’ requirements for the highest service and product quality, innovation and cost-competitiveness. Recycled PET is becoming increasingly popular amongst both brand owners and retailers that drive their respective environmental programmes. Plastic as a substrate still offers an excellent alternative to the more traditional glass and metal mediums. The creation of a positive substrate message is a crucial one that Mpact regularly engages in and plays an active role in numerous consumer and corporate initiatives, in conjunction with industry associations such as PlasticsSA, Packaging SA, POLYCO (Polyolefin Recycling Company), PETCO and the Polystyrene Packaging Council. Manufacturing from two neighbouring sites, Mpact’s Wadeville operations enjoy a significant share of the CSD (carbonated soft drinks) market for PET preforms, bottles and closures. It’s also a leading player in wide-mouth PET jars. Employing leading-edge technology, the accent is on high-cavitation preform moulds, oxygen barrier materials and high-output bottle blowing and closures. And, apart from counting among the country’s largest preform manufacturers, this operation leads the field in hot-fill PET technology. Its six prime competencies are injection moulding of preforms; stretch blow moulding of bottles; single-stage injection stretch blow moulding of both bottles and wide-mouth jars: injection and compression moulding of closures; and injection blow moulding of jars. According to Wadeville general manager Kallie Albertse, Mpact’s decision to establish an integrated operation in the region has been vitally important. And, besides managing a truly world-class production facility, the team is mindful of providing unparalleled customer service at all levels. A good relationship with customers is essential, and we ensure on-time deliveries and consistent supply from both production facilities. Internally, we plan production to meet demand, keeping control of the process from start to finish. "Each business unit has a clear environmental strategy, reducing waste to landfill and managing energy use responsibly. In terms of product developments, we’re focusing more and more on lightweighting our preforms, bottles, jars and closures, to reduce carbon footprint for the same volume," reports Kallie. 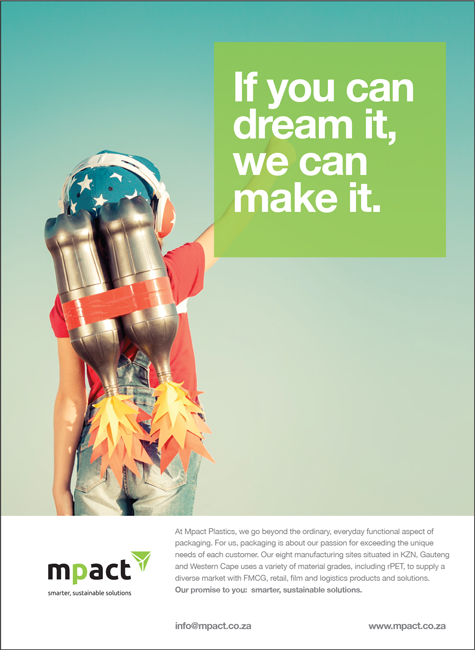 Mpact Plastics’ Pinetown and Atlantis plants supply smart, sustainable packaging to multinational and independent companies in the food, beverage, personal care, pharmaceutical and household product sectors from sites in KwaZulu-Natal and Western Cape. With a 17-year employment record with Mpact, FMCG general manager Paul Visagie divides his time between the two provinces. While both plants offer blow moulding, injection moulding, injection stretch blow moulding, wadding of caps and decoration of containers through labelling and direct printing, some areas of differentiation exist between the two plants. At the KZN plant, in-mould labelled (IML) containers are a speciality. Further expansion into thin-walled IML has been achieved with several iconic packs being produced for leading customers. The Western Cape plant is a leading producer of PVC packaging for a variety of end use markets. Additionally, shrink sleeve application, UV screen printing and labelling are other areas of expertise requiring advanced technology and technically-minded staff. Over the past few years, the Western Cape plant has developed PET packaging for some of South Africa’s best-known food and wine brands. The most exciting development to emerge from this plant was the groundbreaking, multilayer wine bottle. This innovation offers extended shelf life for wine, thanks to oxygen-scavenging technology embedded in the raw material. Keeping ahead of competitors in the FMCG market is all about securing the best people and making sound investments in technology, with sustainability at the forefront. 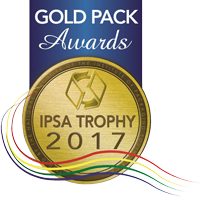 Both plants are ISO 9001 certified with the KZN plant also boasting ISO 22000 accreditation, underlining Mpact’s commitment to absolute food packaging safety. Similar to the Wadeville’s operation of driving and managing environmental issues, a strong focus on sustainability sees both the Pinetown and Atlantis operations going the extra mile to minimise waste to landfill, reducing emissions and maintaining the highest safety standards. Both plants make use of recycled PET (rPET) as part of their sustainability drive and are continually conducting trials with key customers as they move towards adopting rPET as a material of choice. Future plans include the development of new products to take full advantage of opportunities in various market sectors. "Offering a complete packaging solution with cross-selling opportunities, and maintaining a transparent and collaborative relationship with brand owners and suppliers is critical. We believe we’re achieving this," states Paul. "Our aim is to be recognised by customers, large and small, as a market leader when it comes to innovative packaging and sustainable manufacturing." A talented creative team based in the Western Cape offers innovative designs and a prototyping service that uses 3D printing technology, allowing customers to develop packs that truly differentiate their brands on the retail shelf. This Mpact Plastics Innovation and Design Centre is the hub for providing a conceptualisation, development and design service for customers. Comprising of material, design, process and technology specialists, the team at the centre drives innovation using the latest computer-aided design and model-building technology to ensure that all customer requirements are met before a new product comes to realisation. Mpact Plastics has four more factories, some of which service the fast-food packaging and retail sectors. Mpact Versapak, with manufacturing operations in Paarl and Johannesburg, believes that polystyrene remains the most cost-effective food-approved packaging medium, and therefore, many opportunities still exists in this market. It is also a user of rPET produced by Mpact Polymers and is the only polystyrene plant in southern Africa to hold A-Grade certification with BRC (British Retail Consortium). Mpact Plastics Containers (MPC) has scooped a number of awards along the way for several products, including the new-age wheelie bins, jumbo bins and crates. With production taking place in Brits (North West) and Atlantis (Western Cape) their business is categorised into four main segments, viz. agriculture, environmental, retail and materials handling. MCP is known for their best-quality and competitively-priced bulk bins and their focus remains on developing products based on an integral understanding of their market’s needs and processes. They demonstrate their sustainability through the manufacture of lightweight, durable and recyclable products that are designed to save on transportation cost.